Ferdinand Gregorovius, a German historian best known for his studies on medieval Rome, spent the summer of 1860 at Genazzano with his friend Johannes Muller, a painter; the two decided to go on a ride across the Volsci Mountains to see the Pontine Marshes. The journey was described in an account (Aus den Bergen der Volsker) written by Gregorovius for a German paper (you can read the English translation by Dorothea Roberts in Bill Thayer's Web Site). Muller was a watercolourist who later on opened a studio in Piazza Barberini. Gregorovius and his friend reached Segni after a ride of three hours across the valley of the River Sacco which they crossed near Valmontone; they entered the town through Porta Maggiore, which, notwithstanding its name, was the only gate. In the XIXth century Segni occupied only a part of the site of ancient Signia, a town on the northern side of the Volsci Mountains which according to tradition was conquered (or founded) by Tarquinius the Proud, the last Roman king in 513 BC. 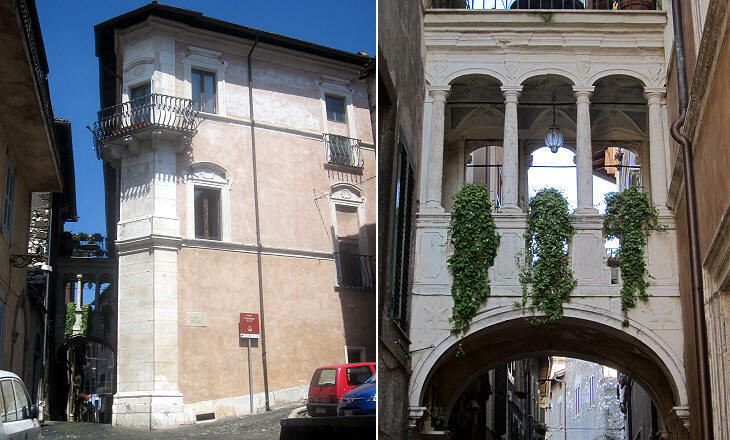 Ancient Roman inscriptions and fragments of reliefs can be seen on the walls of many buildings of the town. 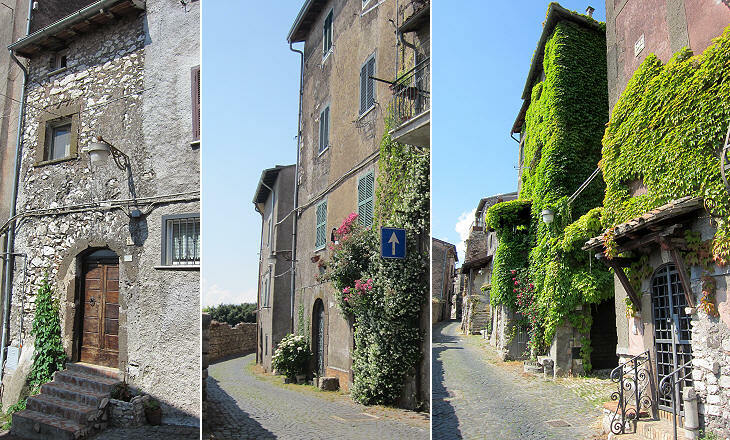 Gregorovius was impressed by the poor houses he saw in Segni; they were built with white calcareous stones mixed with black tufo which overall gave them a grey colour; today most external walls have been covered by an outer layer, while flowers and climbing plants give the houses a bright appearance. 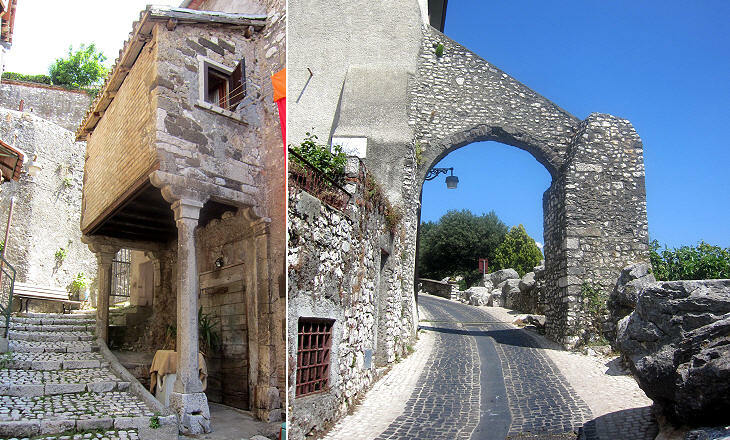 Similar to nearby Montefortino, Segni was plundered by the troops of Pope Paul IV in 1557, but it still retains some medieval buildings. Ponte Scarabeo is a medieval arch built between a house and the ancient Roman walls; its unusual name is associated with a tale about a scarab donated by a Carthaginian prince to a local girl. 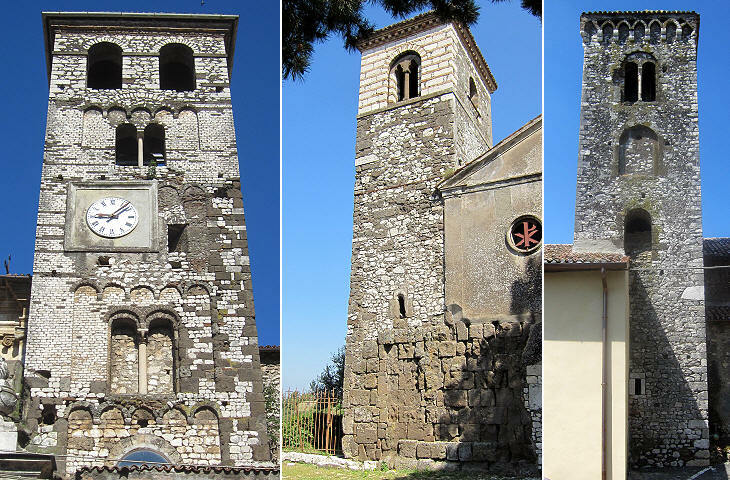 The Romanesque bell towers of Segni are a sign of the importance acquired by the town in the XIIth and XIIIth centuries when several popes resided there for a short time; in 1198 Lotario dei Conti di Segni, a member of the family which ruled Segni, became Pope Innocent III, one of the most important popes of the Middle Ages and a keen asserter of the supremacy of the popes over kings and emperors. The cathedral of Segni was entirely redesigned in 1626-57 in a period during which several families competed for being assigned the town which eventually was assigned to the Sforza Cesarini (who had another fiefdom at Genzano in the Alban Hills). 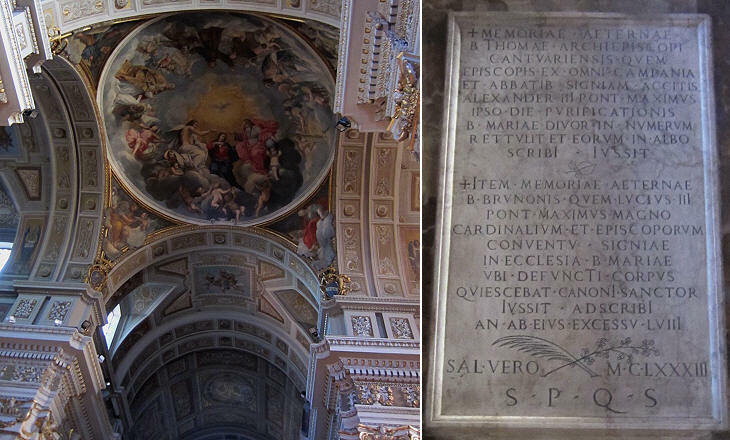 An inscription was placed in the new building to celebrate two events which had occurred in the medieval church: in 1173 Pope Alexander III canonized Thomas Becket and in 1183 his successor Pope Lucius III canonized Bruno of Cologne. 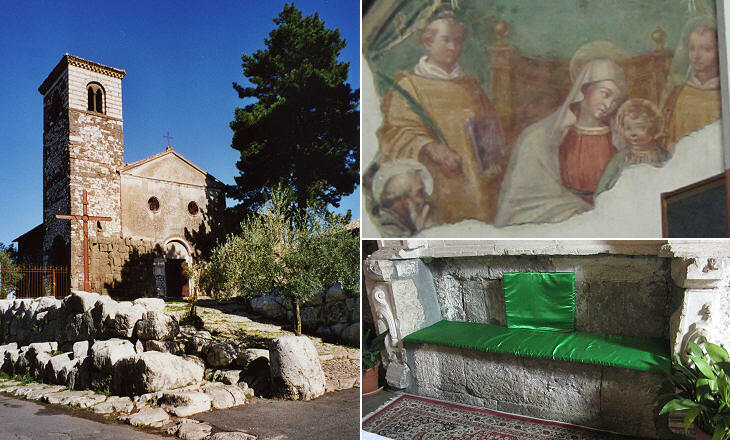 These two popes were able to reside in Rome only for short periods as the city was hostile to them; they often stayed at Anagni and Velletri, but occasionally also in Segni. The canonization of Thomas Becket only three years after his death and his inclusion among the martyrs (the inscription is decorated with a palm leaf, the symbol of martyrdom) was a political act against King Henry II of England who challenged the rights and privileges of the Church. The Sforza Cesarini were more interested in the Roman theatrical life (they built Teatro Argentina) and in the development and embellishment of Genzano than in living in Segni; for this reason Palazzo Cremona is the only XVIIIth century building which stands out from the grey houses of Segni because of its elegant loggia which connects to the building across the street. Gregorovius was anxious to see the ancient walls of Segni which in addition to the modern town surrounded a large area along the slope of an isolated hill. 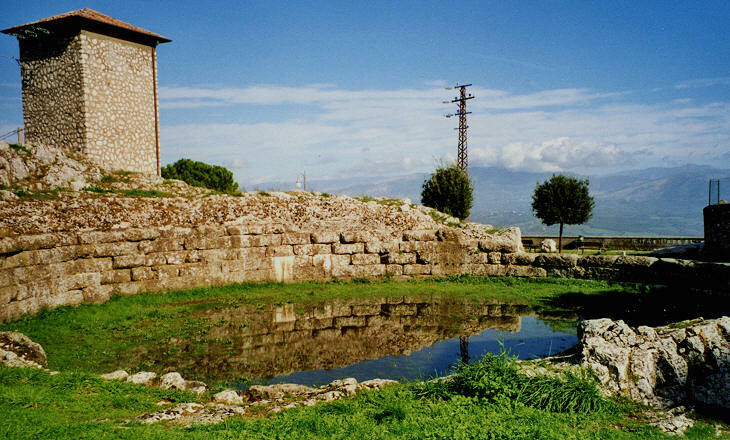 Because of its walls and gates Segni is twinned with Mycenae, one of the major towns of Ancient Greece in the period 1600-1100 BC. The walls of Segni however are not as old as those of Mycenae: it is now believed that they were built after the Roman conquest; they are called polygonal walls for the shape of their stones, but Gregorovius preferred to use the term cyclopean, which was utilized by Pliny to mean that only those mythical giants could have moved these boulders. 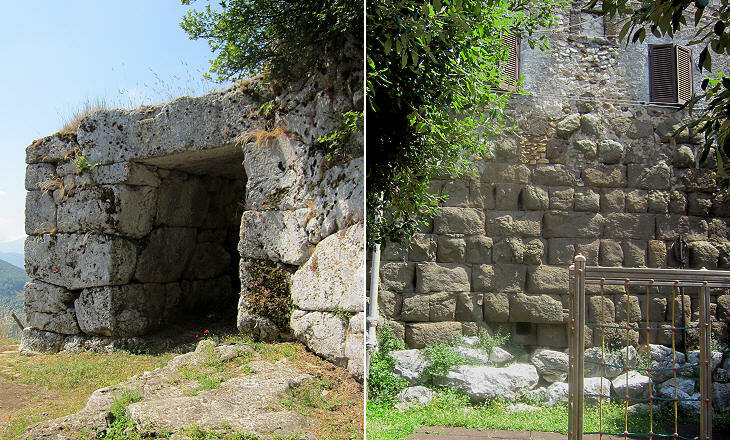 This gate was called Porta Saracena after a Saracen (Arab) raid; these raids were not limited to towns on the coast, but reached sites very far from the sea. 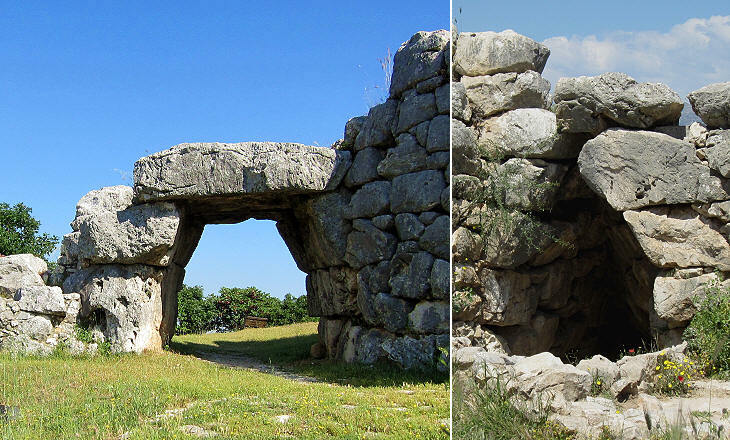 Porta Saracena consists of a corbel arch closed by an enormous boulder; it has been compared to the Lion Gate of Mycenae, but a more appropriate comparison would be with other corbel arches at Mycenae and Tiryns. 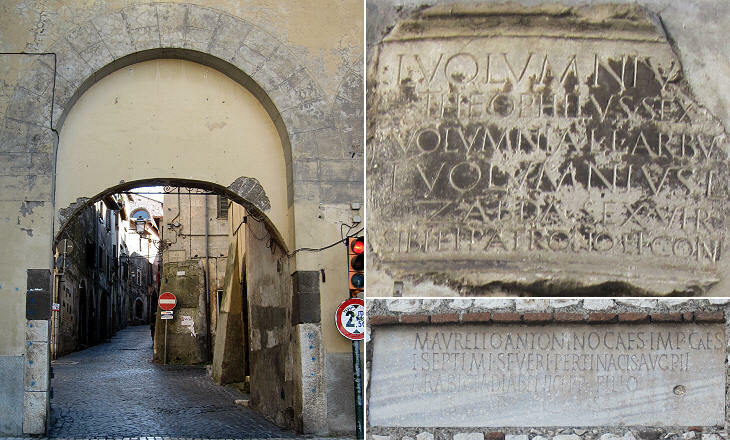 The name given to this other ancient gate, in the lack of more plausible explanations, is thought to be a reference to Byzantine Emperor Phocas to whom a column was dedicated in the Roman Forum. 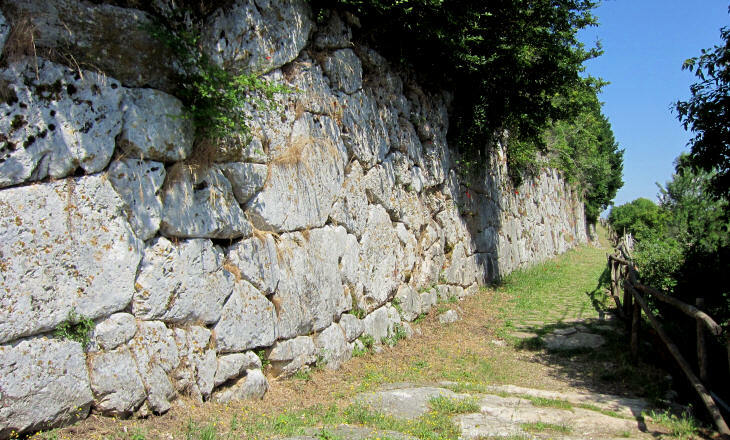 Segni has also sections of ancient walls built at a later time and which were aimed at supporting some small terraces (similar to those which can be seen at Cori). Gregorovius reached the acropolis, the top of the hill where the Romans built a large cistern which was still utilized when he visited Segni; Pliny the Elder (Historia Naturalis - Book 35 - XLVI) mentioned the town for opus signinum, a particular mode of flooring made of tiles broken up into very small pieces, mixed with mortar and turned into a paste which had impermeable properties and was used for aqueducts, pools and cisterns (more on Roman construction techniques). On the acropolis archaeologists have identified a temple of the IIIrd century BC which replaced a previous temple dedicated to Juno Moneta; this epithet of Juno meant she was worshipped as protectress of funds; eventually the epithet became a noun from which the word money derives. A church was built inside the cell of the temple; in 1965 some medieval frescoes were discovered behind later additions. Gregorovius was at the acropolis on a Sunday evening and he watched the inhabitants of Segni who reached the site wearing their best suits, enjoying the breeze and the view over Anagni which is located on the other side of the valley of the Sacco River. Gregorovius enjoyed a dinner at the only inn of Segni; in his account he praised the local wine, although he knew that Martial (XIII. Ep. 116) warned about its astringent effects: Potabis liquidum Signina morantia ventrem? / ne nimium sistas, sit tibi parca sitis (Will you drink Signine that constricts relaxed bowels ? That you may not check them too much, let your thirst be sparing - translation by Walter C. A. Ker). 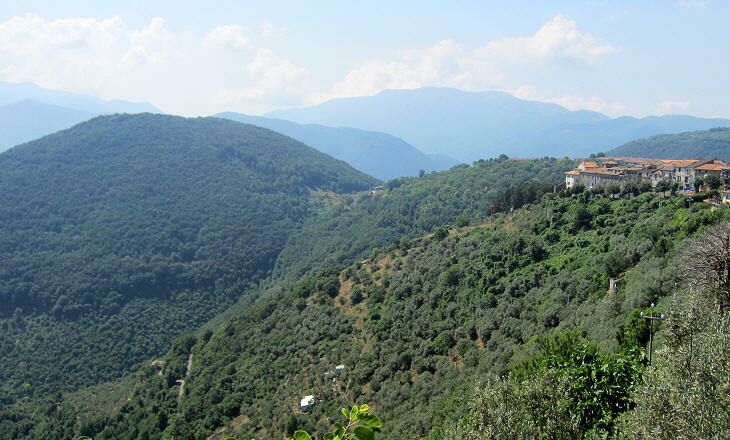 On the next day Gregorovius and his friend were ready to cross the Volsci Mountains (with the help of a local guide) to reach Norma (but you may wish to see Carpineto first).